The cover of the acclaimed book. Be More Feegle is a guild inspired by the Nac Mac Feegle from the novels by Terry Pratchett. We love drinking, fighting and stealing the occasional ship. The Nac Mac Feegle (also sometimes known as Pictsies, Wee Free Men, and the Little Men) are a type of fairy folk that appear in Terry Pratchett's Discworld novels Carpe Jugulum, The Wee Free Men, A Hat Full of Sky, Wintersmith, I Shall Wear Midnight, Snuff, and The Shepherd's Crown. Aside from being six inches tall, they just about invert the Victorian concept of mystical and refined fairies, and hark back to the fairies of folklore, who were generally seen as occasionally helpful thieves and pests. 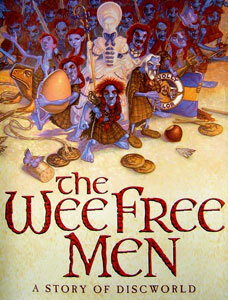 The Nac Mac Feegles' skin appears blue because it is heavily tattooed and covered with woad, and all have red hair. The tattoos identify a Feegle's clan. Wings or similar features of any kind are out of the question. Their speech can only be described as some sort of variation on the Scots language, usually Glaswegian in the clans encountered so far, although William the Gonnagle (from a different clan) has a softer, Highland accent. They are notably strong and resilient, which comes in handy given that (almost all) male Feegles tend to be notoriously rowdy as a lifestyle. The Feegles spend their time drinking, fighting and stealing, alone or in various combinations. The immense strength and rowdiness of these pictsies means that they will fight anything, and they have a particular fondness for headbutting creatures far larger than themselves. In a good fight, a Feegle will take on all comers, including his fellow Feegles (or, in their absence, themselves), with such enthusiasm that makes missing someone hazardous ("Crivens! I kicked meself in ma ain heid!"). Some clans have an apparently superstitious fear of their names being written lest they appear on unwelcome legal documents. Some of the upland clans have mastered the concept of law as a weapon however, and note that it is a good idea "neever tae sign a feegle contract; six inch high people write verra small print". Beware the cry, "We've got a cheap lawyer an' we're not afraid to use him!" The Feegles' swords glow blue in the presence of lawyers. Despite their criminal tendencies, the Nac Mac Feegle do possess a sense of honour. They see no sport in fighting the weak. They may take one cow from a man with a herd of fifty; however, they will not steal an old woman's only pig, or an old man's only pair of false teeth. They claim it was a difference of opinion over when to stop stealing that led to their exile by the Queen of the Fairies. As a rule, the Nac Mac Feegle will never steal from the truly poor. So join "Be More Feegle!" guild for a high auld time. This page was last edited on 14 April 2016, at 11:19.